Plot synopsis: A trapeze artist in a circus plans the murder of a friend and fellow performer after the latter gets engaged to the woman he loves. Based on a short story by Cornell Woolrich (writing as William Irish), first published in Black Mask magazine, in February 1943; and later in his short-story collection Dead Man Blues, in 1948. Plot synopsis: A newspaper reporter and aspiring writer marries a young woman with a terminal heart condition in order to inherit her fortune, but once they are wed, he becomes impatient when she does not die as quickly as he had hoped. Review: This is a very pulpy noir thriller, but also very enjoyable. It is cleverly plotted, with various twists and turns that make for a very entertaining listen. In particular, the mechanics of the plot include quite a few neat touches, such as the way the protagonist gets the wife he intends to murder to write her own suicide note, as well as the means by which he gets his fingerprints onto the doorknobs of a hotel room he never visits. The performances, too, are good, and the script - if not dazzling - is certainly proficient. Still, it's the ending that lingers most in the memory, as this contains a couple of major surprises. To discuss these, I need to offer a SPOILER ALERT! as I'm going to give away how the episode concludes. What I found most interesting about the story's ending is the issue of whether or not the protagonist's fate can be considered 'just', since he is given the death penalty for a murder he didn't commit. There are other Suspense episodes in which characters are punished for murders they did not carry out, yet in most of these they are nonetheless guilty of different killings, so there is a sort of karmic justice at work. However, in this case, the main character didn't actually kill anyone - even if he had intended to - which makes the right or wrong of the conclusion somewhat ambiguous. Yes, the protagonist is pretty repellant, morally speaking, but does he deserve to be executed when he isn't in fact a murderer? Also, what about the real killer, who presumably gets away scot-free? The episode leaves the listener with a number of unanswered questions such as these, which provide food for thought even after it has ended. Plot synopsis: The two servants of a wealthy, reclusive couple plot their employers' murder, so that they can take over the latters' identities. Plot synopsis: A serial strangler of young women uses his friendship with a detective in the LAPD to try to keep ahead of the investigation into his crimes. Based on a novel by Dorothy B. Hughes, first published in 1947.
Review: Listeners may be familiar with the story that serves as the basis for this episode from the Humphrey Bogart-starring film noir classic of the same title. However, the film version differs significantly from the source novel - especially regarding the issue of the main character's guilt or innocence - whereas this radio adaptation is much more faithful. 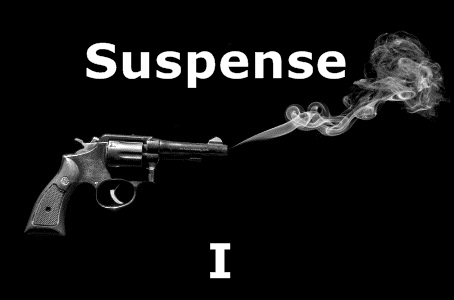 This is also one of the strongest of Suspense's one-hour episodes, some of which can feel overlong, perhaps because it is based on a novel, and thus there was plenty of material to fill the running time. It is also very striking in being presented from the perspective of the murderer, rather than that of the detective trying to capture him. Consequently, this isn't a traditional whodunit, as we know from early on who the killer is; instead, it is a psychological thriller, more concerned with getting inside the murderer's head than with the conventional mechanics of most crime stories. At any rate, this is a very well-written, well-performed episode, which makes good use of its sixty minutes to build slowly to a satisfying climax. Plot synopsis: A man who witnesses a murder on the street quickly becomes the prime suspect. Plot synopsis: After stopping to eat lunch while driving through the desert on the way to California, a couple is waylaid by a pair of miners who tries to trap them in their car so that they will die in the stifling heat, leaving their vehicle free to be robbed. Review: The central conceit of this episode is quite a good one - attempting to commit murder not with a gun or a knife but by allowing the intended victims to die of thirst beneath the burning desert sun. There is also a reasonable degree of tension as we wonder how, or whether, the couple trapped in their car will escape their potential murderers. So, overall, an enjoyable thriller, which is certainly much better than many late-period Suspense stories. At the same time, there are deficiencies that detract. For one, the dialogue is functional rather than memorable and sometimes even clunky - a number of times characters explain things to each other which both must already know, purely as a means of delivering information to the audience. Another definite problem is that, although Mandel Kramer in the role of the husband clearly conveys the sweltering heat and desperation of the couple's situation, Ellen McRae's performance as his wife is, frankly, much weaker, as she communicates almost no sense of fear or panic; instead, she sounds like she is simply reading lines from a script in a radio studio. I was also disappointed by the denouement - I won't reveal how the story concludes, but it would have had much more impact if the final scene had been cut and the episode had instead finished with the preceding one featuring the two miners, as this would have left it more open-ended and intriguing. Plot synopsis: A young boy who suffers from asthma dies in suspicious circumstances at home, leading the police to suspect that he may have been murdered by his father. Based on a story by Eleazar Lipsky. Review: An episode about the killing of a child would have been quite shocking in 1959 - and still is today. It's hard to know what to make of this story, which is no more subtle than its title would suggest, as it seems to have no other aim than to shock its audience with the details of the crime committed. It is clear from very early on who is responsible, so there is little in the way of suspense, and the bulk of the episode is simply taken up with the father's police interview, in which the how and why of his son's murder are brought to light. In this, it is both unpleasant and dull in equal measure. There's not much else worth commenting on about this story, as there is nothing in it of any real merit. One of those late-period Suspense episodes that shows, unfortunately, how far the series had declined since its heyday.